Amp falls short of our expectations and represents poor value for money for those who would have to pay for it. Free for Suite 8 users. Suitable for processing synths, loops, etc. Can operate in stereo. Unimpressive cab/mic section 'Flat' and uninspiring to play through. Overdriven/distortion tones are poor. Bottom end is muddy and boomy. No tuner… not much of anything, in fact. Live has traditionally been associated with programming, loops and synthesis, but over the past few years Ableton have made serious in-roads into the more general multitrack recording/mixing side of DAW usage. To this end, the company have released Amp, a guitar amp package that's free to owners of Suite 8, and available to regular Live owners for a fee. 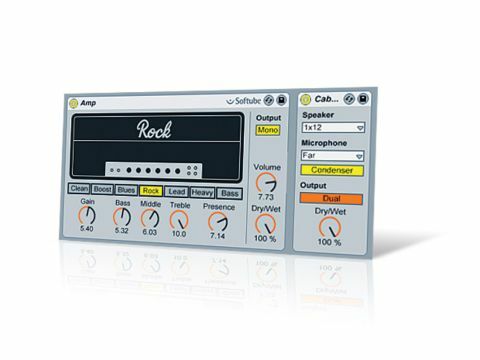 Amp consists of two Live effects: Amp and Cabinet, which emulate a guitar amp and a speaker cabinet respectively. You need to place Cabinet after Amp for a realistic 'amp running through speakers' tone. The GUI is pure Live: clean, simple and the usual dinky size due to Live's rack system. Amp's controls are minimal: Gain, Bass, Middle, Treble, Presence, Volume. There's also a Dry/Wet mix control, which will be of most use when processing loops or synths. There are six "legendary" amps to choose from, with models labelled Clean, Boost, Rock, Lead, Heavy and Bass, the latter being a bass amp. The Clean amp makes an aural and visual nod towards the Vox AC30, and the Rock amp appears to be based on the Marshall JTM45. Cabinet is even more basic. You have a choice of cabinets with a dynamic or condenser mic with a close on or off-axis placement or a 'far' placement. You also get a bunch of presets in the form of Live racks. From the tonal modification angle, Amp is unquestionably capable. Synth or programmed bass parts, for example, are immediately fattened when Amp and/or Cabinet are thrown into the equation, and with parameters kept to a minimum, it's clear that this could become an essential tool for those who crave additional sound-sculpting options. It works in stereo, too. Then again, Live already has several overdrive/distortion effects, and there are plenty of other amp sims that could just as easily fulfil this role. So how does it fare as a guitar amp sim? Well, with DSP wizards Softube being behind Amp, you'd expect it to sound rather good, and… it doesn't, oddly. The blues amp model is quite useable, but most amp sims can dish up decent clean tones these days. As you move up to the amp models with higher gain capabilities, the tone becomes increasingly unimpressive, with a tendency to become muddy or abrasive and quite often both. Amp seems to kick out too much bass, resulting in a strange, boomy bottom end with some odd resonances going on. Cranking up the gain makes the tone increasingly fuzzy and buzzy, with a lack of bite, crunch and dynamics. Cabinet offers 1x12, 2x12, 4x12, 4x10 guitar cabs and a 4x10 bass cabinet. Like Amp, it's a sonic disappointment. For starters, the cabs don't always represent the kind of sound we expect from real-world gear - the 4x12 sounds thinner and 'lighter' than the 1x12, for instance. This wouldn't be such a big deal if the cabs sounded good in their own right, but they're nothing to get excited about, and they do little to bring Amp to life or to curtail its wayward bottom end. Using an EQ before Amp to shave off some of the low frequencies does help but this really shouldn't be necessary, and the results still aren't great. Likewise, we sometimes found ourselves using a Utility plug-in to drive the input harder, because Amp's Gain knob wasn't enough. Finally, we tried using a third-party cabinet simulator (Audio Ease's Cabinet) instead, and this was an improvement, although Amp still failed to impress us. The amp sim market is a highly competitive one, and Amp doesn't cut the mustard. There are plenty of choices around this price point (and indeed, below it) offering better tone and far more features - Amp doesn't even have a tuner, for crying out loud! And being a Live effect, you wouldn't be able to load it up in another DAW, further limiting its usefulness.